As usual there is no sailing during the winter and so we have time to peform the necessary maintenance. Hence, after the Saint Nicholas trip, the boiler was emptied and this was the the signal for a special day for the Black Choir, cleaning of the fire tubes. A nice job with a good tasting beer afterwards. 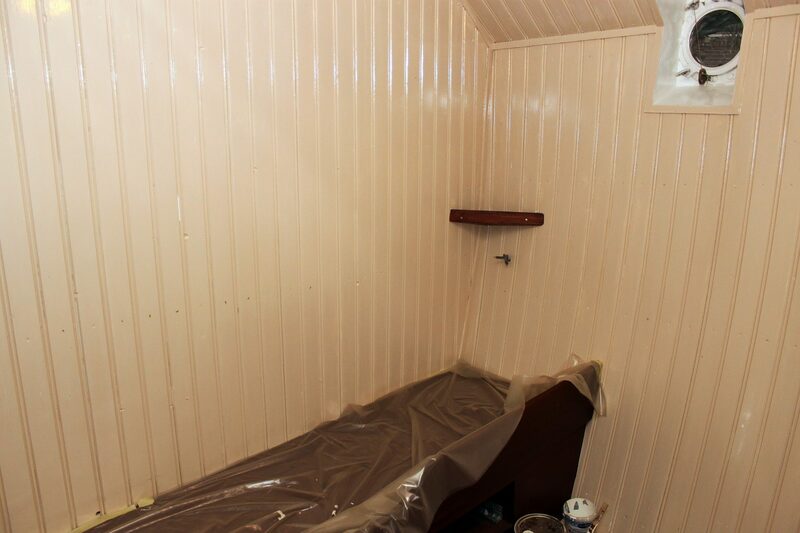 Our two carpenters are making good progress with the complete renovation of the portside Engineer’s cabin. The cabin was completely emtied, the steel worl conserved and paneled with wood. Furniture was arranged and this was made by an apprentice of Klerk Yacht Interiors. The design is based on a drawing from 1953. Currently the majority is painted(see photo). After replacing the three doors of the cabins the Engineers can occupy his cabin again. This project could be realized thanks to the support of De Klerk Yacht Interiors in Moordrecht and Lions Club Maassluis. Other ongoing jobs are painting of the boiler room and the refurbishment of the three steering wheels. Plenty work. The Board and other volunteers of the Hollands Glorie Foundation wish you a Merry Christmas and a prosperous 2015. Mr. Andriessen with his creation. The residents of the apartment building ‘Furie’ at the Santplaet in Maassluis, have previously sponsored two fire tubes and so helped to fund the replacement of all the tubes from the boiler to the Furie. Afterwards, we were asked if we had another piece of old tube and whether that could be used to create a work of art from it. No problem. Recently, we were called by Mr H. Andriessen who asked if we wanted to see the result created by him. The artwork consists of three pieces of tube and a picture hanging in the building across from the elevators. Where an old tube can be put to good use. We also did some sailing. 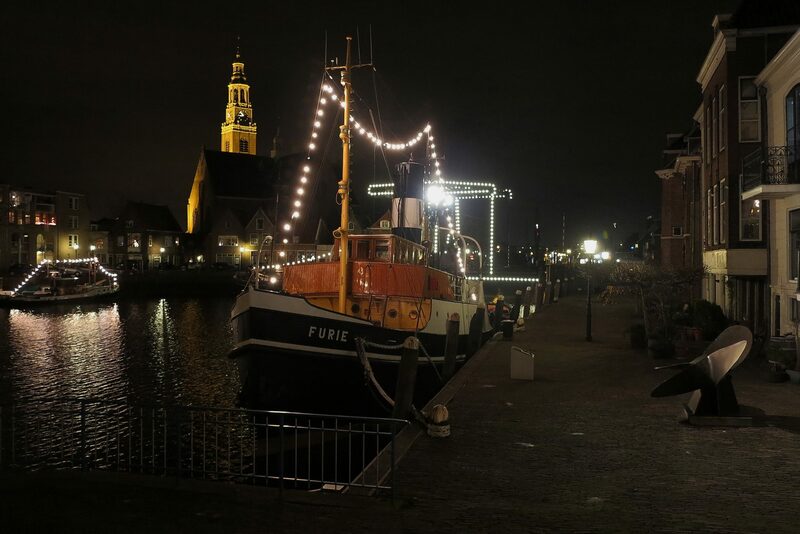 On November 14 we made a trip on the river with a group from The Hague and on Saturday, November 15th we had the annual arrival of Saint Nicolas. Despite the rain it was quite busy along the quayside. Many children with their parents saw the steamship Spain with Saint Nicolas and his entourage enter the port. The fuel was this time sponsored by Reinplus Van Woerden Bunker BV Argos. Later in the day there was the traditional sponsor trip to the port of Rotterdam. Enjoyable but wet. Henk and Ton after the official fairwell from Henk. Photo: Jan Steehouwer. 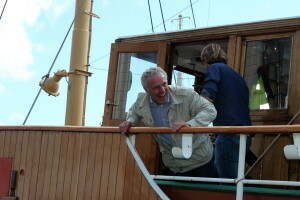 Henk de Haas , the man who at the time brought the Furie to Maassluis and founded the Hollands Glorie Foundation, considered almost 37 years of chairmanship enough and late last year he announced he wanted to resign. The board of the society together with the Advisory Board were tasked to find a successor and found him in Ton Raemakers . In late July Henk has passed the baton to Ton. On October 5th, we officially said goodbye to Henk, of course aboard the Furie. 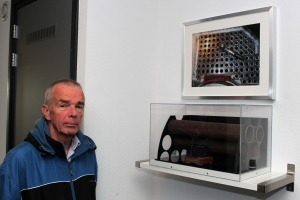 Henk was accompanied by his wife, children and grandchildren. It was quite a surprise for our former chairman that Koos Karssen, Mayor of the Municipality of Maassluis, awarded him with the city’s Medal of Honor. After the official part we made a sailing trip. 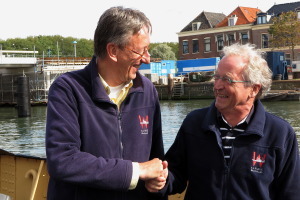 Upon return to Maassluis, Henk was addressed by his successor who appointed him honorary chairman of the foundation. In the recent period some more sailing was done. First, on Saturday September 6th for Alphatron in Rotterdam. As the World Harbour Days were held in that same weekend the Erasmus Bridge in Rotterdam only opened morning and evening at 7 o’clock. So it was decided to depart Friday afternoon, otherwise the black choir had to make a very long day. All had a great day and satisfied customers. 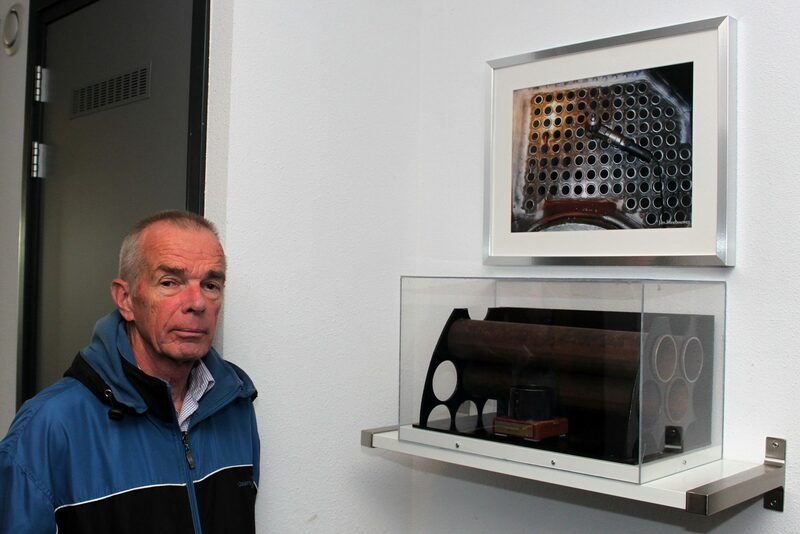 On Thursday, September 25th, the exhibition in Museum Maassluis : “35 years Furieade ” was officially opened by the mayor. An exhibition where various items from our archive can be seen. The 35th Furieade on 3 and 4 October, was also quite a happening as it was a joint event with the closing ceremony of 400 years Maassluis. 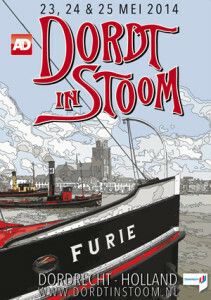 A spectacular opening with a leading role for the Furie on Friday , followed by a lantern parade with 5,000 participants , fireworks on the river and a performance by Ali -B. On Saturday it was beautiful warm weather, which resulted in many visitors and a cozy atmosphere. After we had gotten a few pictures from a previous crew member from Sweden in June, recently an ex colleague sent also pictures. 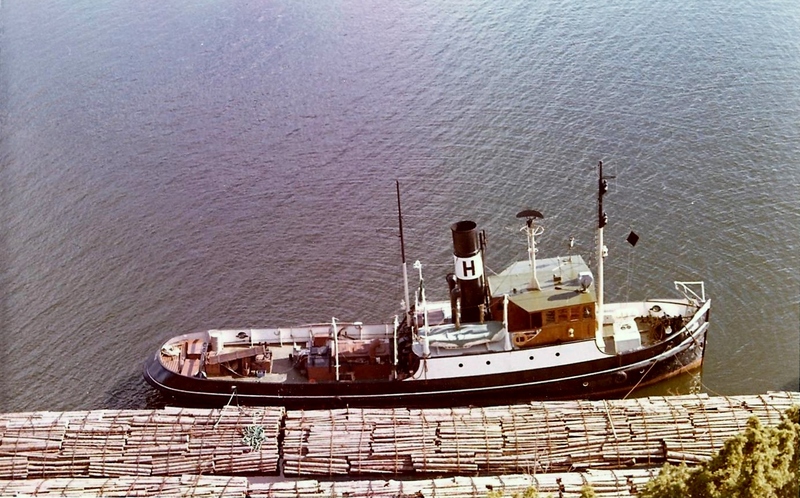 Ronnie Svensson, who from 1966 to 1976 was Chief Engineer, first on Holmen III and later on Holmvik, had found the tug through our site. He was impressed with the condition of the Furie and sent forty photographs from the period when he was on board. Very valuable for our archive. It’s not just pictures where you can see how at that time timber rafts were towed but also how the engine room and boiler room looked. There is also a photo of Ronnie’s wife who worked on board as cook. In the TV program Max Monumentaal, an initiative of the BankGiro Lottery, Huub Stapel shows how buildings are being restored which from a cultural point of view deserve to be preserved. O n July 1, Huub Stapel presented the key of the restored Delflandhuis in Maassluis to the Foundation Hendrick de Keyser. Since the handover took place at the Stadhuiskade, the Furie also came into the picture. 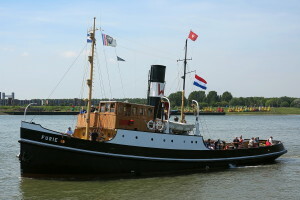 The closure of the program, after a city tour, was recorded in the wheelhouse of the tug. All in all great advertising, thanks to Max Monumentaal. The series is being recorded by Endemol and will be broadcasted by Broadcast Company Max this autumn. In the recent period there has been done a lot of work. The stand at SB – side of the bridge deck back was removed, conserved and placed back straightened and then there was the necessary regular maintenance. Currently we are working on replacing the glass slats of the windows of the wheelhouse, new furniture is being built in the PS forward cabin and the black choir is busy installing the piston driven steam generator. A few weeks ago we were approached by the nephew of an ex crewmember of the tug. Hij asked if it was possible to visit the Furie with his uncle. Obviously that was possible and they came over on Thursday 12th of June. 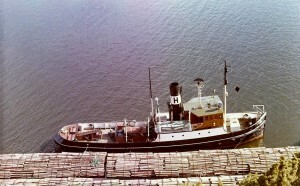 It turned out that he used to be an able-bodied seaman on board the tug, then called Holmvik, in 1974. He was responsible for the chain connections of the wood rafts. A lot of stories and pictures and an ex-crewmember who was really impressed with the present state of the vessel. A succesful visit after which we went for a little sailing trip. Last Friday, Saturday and Sunday we did trips with various groups to Rotterdam. Thanks to the beautiful weather, this trips were a great succes. From now on we time for the necessary maintenance. Presently the carpentery of the port side forward cabin is ongoing and the maintenance of the wheelhouse wood work started. 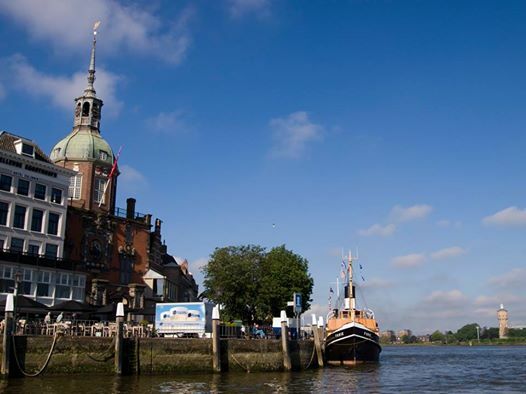 On Friday, May 23 we sailed with a lot of guests on board to Dordrecht to participate in the biggest steam event in Europe: “Dordt in Stoom”. After a prosperous voyage we arrived in a nostalgic atmosphere with steam tugs, steam engines and a steam train. In the evening the Furie participated in the fleet review and on Saturday and Sunday the vessel was open to visitors. Some 900 people have visited the Fury. After a great trip homewards on Sunday we were back to our home port Maassluis. A brilliant weekend thanks to the nice weather. 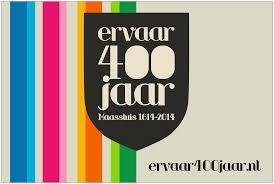 On May 16 it was 400 years ago that Maassluis officially became an independent municipality. This joyful event was and is celebrated with the start of ceremonially signing the Deed of Separation by the mayors of Maassluis and Maasland and it will finish with the Furieade in October this year. Saturday, May 17 there was “400 years Maassluis Maritime Experience”, a day with beautiful weather, many ships in the harbor, music, dance and crafts demonstrations. Round trips on the river were available with several ships, including the Furie. The old lady has done four tours of which was the first one was moderately busy but the other three were sold out. The highlight of the day was an afternoon fleet review on the river with some 50 vessels, tugs, fishing vessels, freighters and of course the Furie. It was quite a spectacle that many people came watch. 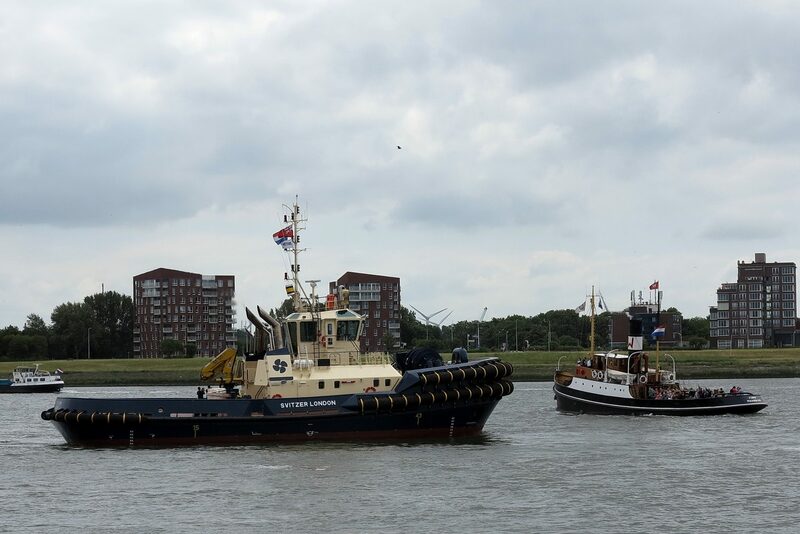 On Saturday May 17th the Maritime Opening Event of 400 Years Maassluis takes place. Obviously the Furie will participate. The tug will make tours every 75 minutes from the outer harbor at the Govert van Wijnkade. The first trip starts at 10.00 hrs, then at 11.30 hrs, 13.00 hrs and 14.30 hrs. Fee is € 5.00 per person. At 16.00 hrs there is a two hour trip during the Fleet Parade, fee is € 10.00. Tickets will be available shortly at the V.V.V. Maassluis, located at the Heldringstraat, and if still remaining, on location at the stand of the Sleepboothaven Maassluis Foundation on the Govert van Wijnkade. On Friday May 23th we depart for Dordrecht to take part in the biggest steam event in the Netherlands: Dordt in Stoom. 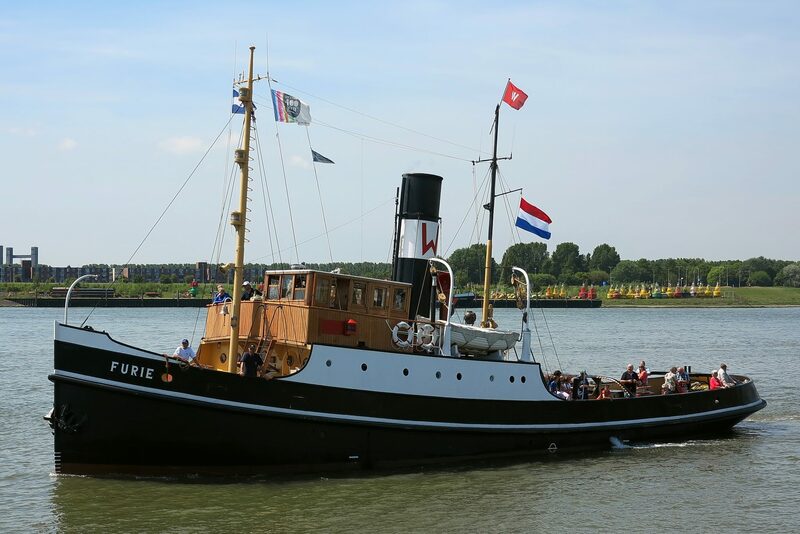 On Friday night the Furie will participate in the Fleet Parade and on Saturday and Sunday she will be open for visitors at Het Groothoofd. Sunday evening we will sail back to Maassluis.